Sydney Shop Girl: Sephora, APEC, G20 and Sticky Tape. Australia, it's happening. All kinds of 'its'. Almost too many to fit into one hump day blog post, but let's see how we go. From Sephora Australia's Facebook page. First up Sephora Australia. Grand Opening Day is Friday 5th December. I know what you're thinking. They lost our invites in the mail and they left our email addies off the group email offering VIP exclusive offers and platinum loyalty memberships. It's been an interesting process watching the launch unfold. While many of the other international retailers that have launched here have had plenty of fanfare on their global websites and options for you to add yourself to their mailing list, Sephora's website has remained strictly business as usual, at least when I checked last week. In hindsight, that Sephora Orlando haul wasn't so excessive after all. Three cheers for serendipitous intuition. Unofficial sources (commentators on the Sephora Australia Facebook page, actually, perhaps that does make it official given that some newspapers create whole front page news stories from Facebook profiles...) suggest that the brand lineup on offer in Australia will be a severely edited shortlist (pardon the pun) compared to those of the mothership American and Asian stores. Urban Decay and NARS were names I heard they wouldn't be selling here. Also, an Australian online store appears to be a somewhere in the horizon kind of affair. All of which seems to defeat the purpose of a local Sephora for many of us. I'm emphasizing that all of the above is purely what I've read around the traps and isn't from official sources. But do you have any intel that could either confirm or deny the above? I bought four different shades of brown eyeliner from Sephora and have actually managed to get good use out of them all. But all is not lost, Sydney. I'm pretty sure Sephora's own cosmetics will be available. These 12 Hour Waterproof Contour Eyeliners are a must have. I've been using mine on a daily basis for the last few weeks and I can't fault them. They apply evenly and last all day. They even make it through cardio in looking better than I do. Which isn't that hard but still. So this happened at APEC. 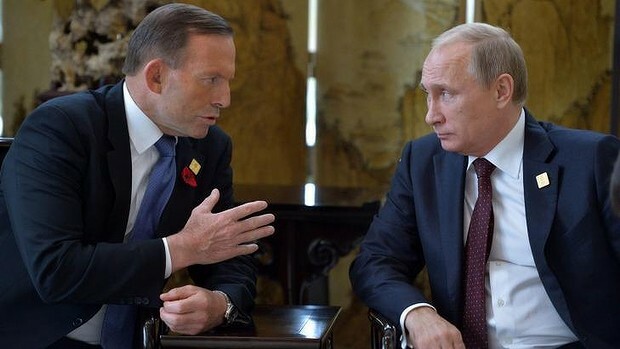 The Prime Minister Abbott shirtfronting (oh cool, I looked up my first word in Wiktionary) of Mr Putin over flight MH17 and the need for a public apology for the loss of Australian life on the flight. On his part, Mr Putin looks Amused. But that could've been over the Sephora revelations. The G20 Summit is nearly here and the only facts about it that I can recall off hand at the moment relate to the little things. Like how all delegates have been warned to avoid the use of gifted USB sticks because they may be the agents of cyber terrorism and not just important PDFs or PowerPoint slides. And how there is a separate airport for delegates and their families arriving in Brisbane and that their journey through customs will be much briefer than yours or mine. Oh and I think Mr Putin's security vehicles landed in Brisbane last week where they were greeted by a little welcoming committee. I'll be sure to update this post when I get around to reading things of actual political relevance. Work HQ is much calmer at the moment. I've even reconnected with objects on my desk that aren't the phone or computer. I love my heavy duty sticky tape dispenser and its endless roll of tape. It's the best for the lint that's collected on my black, brushed cotton cropped trousers. We've Urban Decay in Sephora Malaysia but sadly no NARS, there is a retail standalone NARS store in KL though with a reasonable RRP. Speaking of that, you have to try NARS sheer lipstick in Manhunt, totally your shade! Sephoras around the world vary do much that the brand doesn't gave reliability..,I was do disappointed in the senhora in Paris bc it didn't really hit don't brief. The ones in the states are the best but Australia needs it snyway for some healthy competition snd price reductions! I have only kind of being following along with the G20 stuff in Brisbane lately, the separate airport I'm going to have to read up on! Poor hubby's been working out at the airport this week so he's had all the extra security hassles. Most people I know are using the public holiday to just get out of Brisbane and go somewhere else, haha! I have read that UD is not coming to Australia. And Tones is just totally embarrassing.